It was the perfect fall day to get a little lost in the woods. 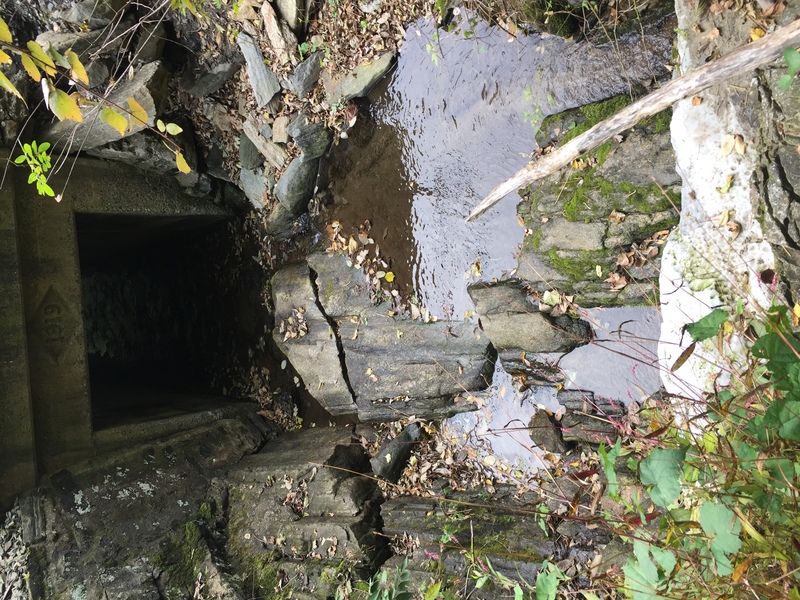 There are two parallel streams running through the valleys at the Schuylkill Center — Meigs and Smith Runs — and that day two teams of staff and volunteers set out to learn more about them. On an artistic and scientific mission, we began this journey to contribute to our latest environmental art gallery exhibit by Stacy Levy: Braided Channel. 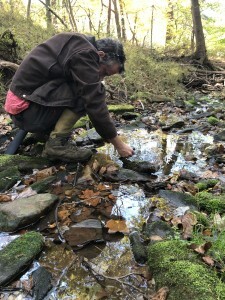 Stacy Levy is an environmental artist with installations all over the world including the Schuylkill Center (read more here). Levy’s vision for Braided Channel includes multiple video screens that display a sample of her site-based works in action. 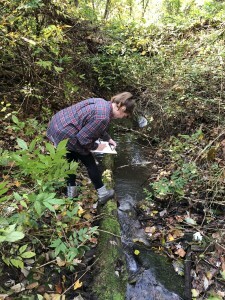 Additionally, she organized this gathering of water samples to construct a “water library” of sorts to tell the story of these local streams. 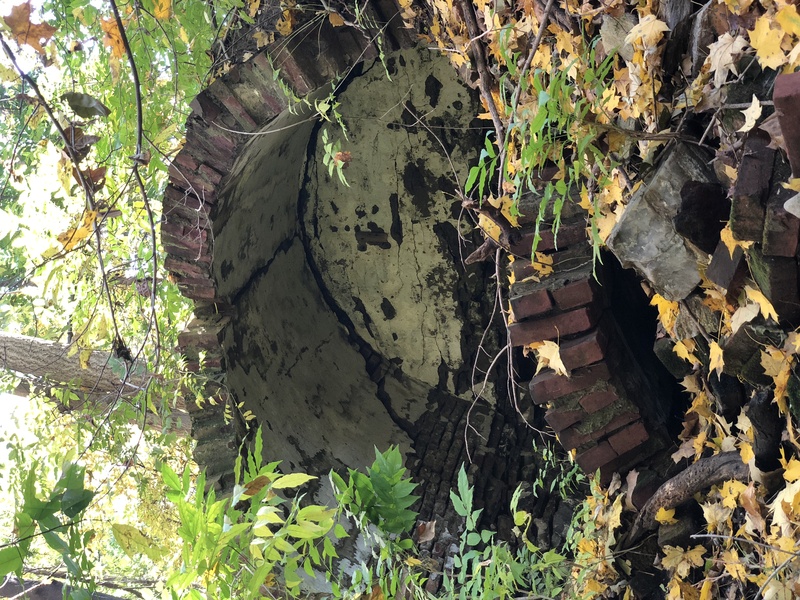 Our findings unearthed details about Meigs and Smith Runs that we never would have understood without delving further into them. 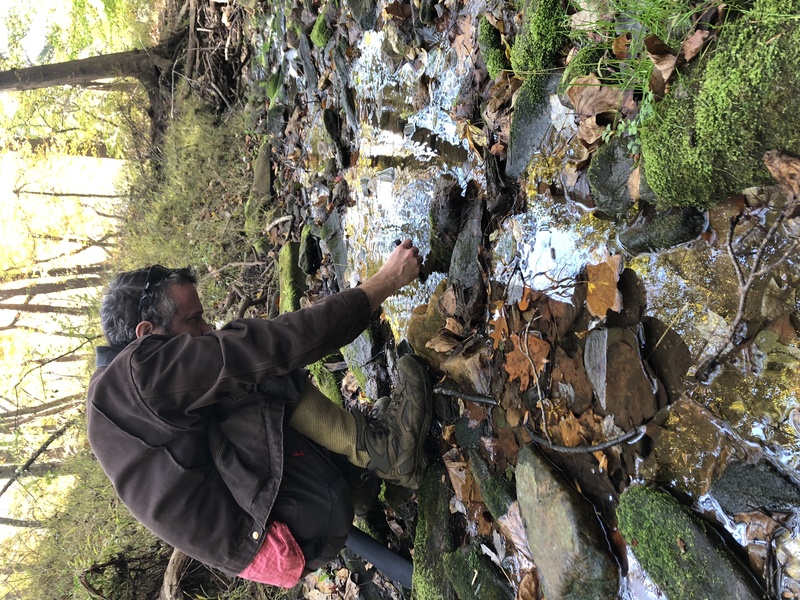 We began near Hagy’s Mill road and followed both streams down to the Schuylkill River Trail, taking a water sample approximately every 130 feet. 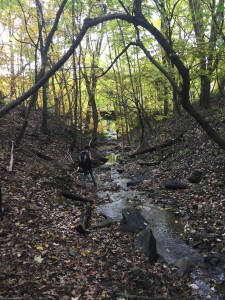 Both teams began this journey with a bit of bushwhacking to find our starting points. It quickly turned into a lot of bushwhacking with the realization that we literally had our skin in the game! Our spirits high, we sojourned on, delighted to spend several hours in the woods. 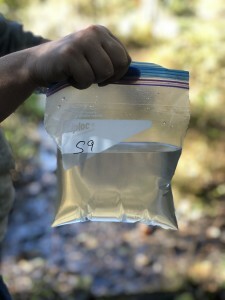 The time passed quickly as we filled our backpacks with Ziploc bags of water samples as we drank in the splendor of the forest and stream. With 340 acres to explore, it’s easy to overlook our two stream corridors. 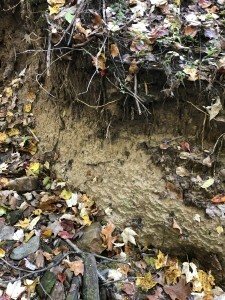 Especially since most of the streams are off limits except for two access points on Smith Run for educational purposes; a condition of the conservation easement on the property. 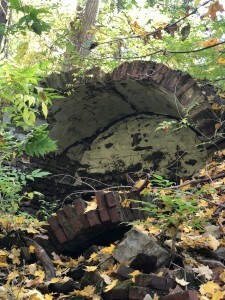 There is no trail to Meigs Run. 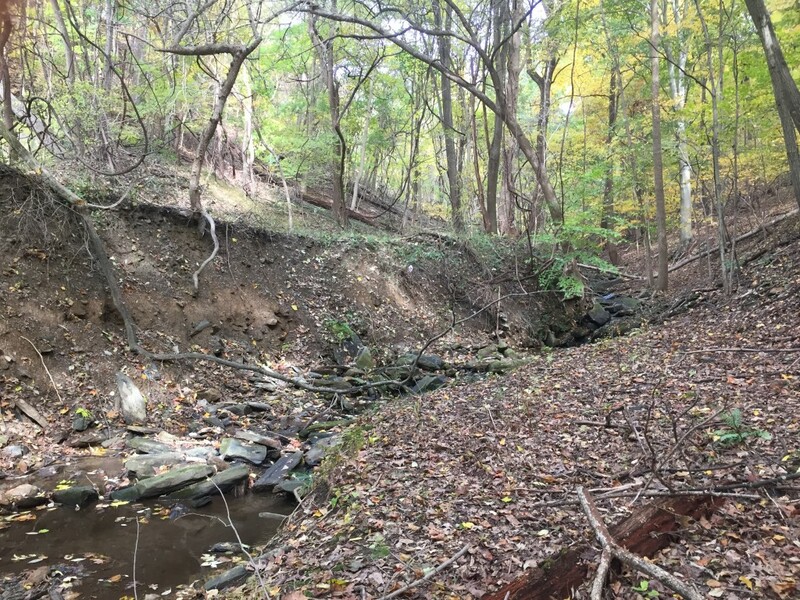 Ravine Loop offers ample opportunity to enjoy a view of Smith Run, although we ask visitors to remain on the trail to avoid damaging these sensitive habitats. With special permission from the Land and Facilities Department we were able explore these unique sections of the property for the exhibit. 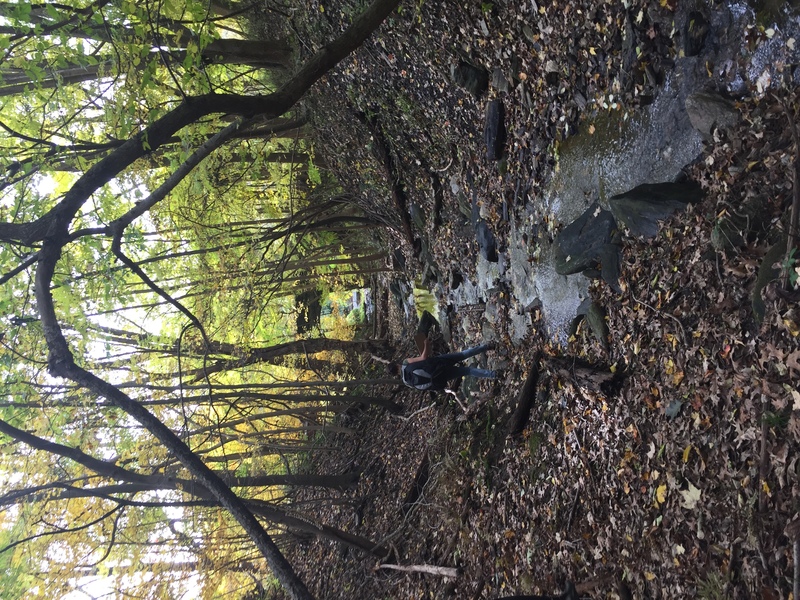 Our walks led us to note some important discoveries about these streams and the land surrounding them. 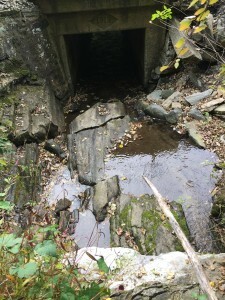 We found four-foot high clay banks, gravel bars, and massive bedrock carved by the continual flow of water. Old deer fencing from abandoned restoration projects lay upon beautiful open hillsides. We experienced changing elevations and temperatures as we moved from forested canopy to open clearings. We met crayfish, frogs, and even a snake along the way. 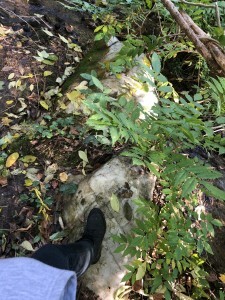 Our discoveries included sites of mass erosion, crumbling stone foundations, lots of moss, dams, and boulder-sized quartz rocks. 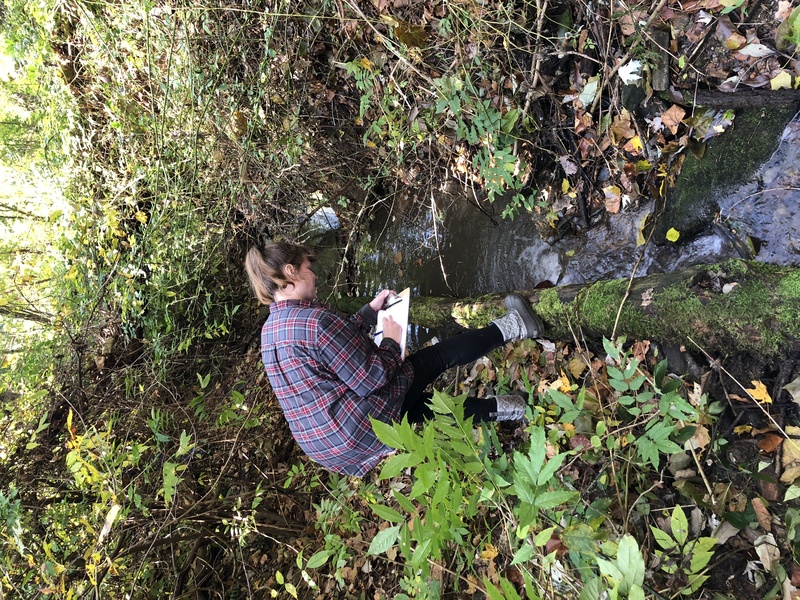 All of our findings led us to a deeper understanding of the hydrology of the forest and we documented it for Stacy Levy’s display. There was much to note on our journey and our efforts were an important contribution to Levy’s exhibit. 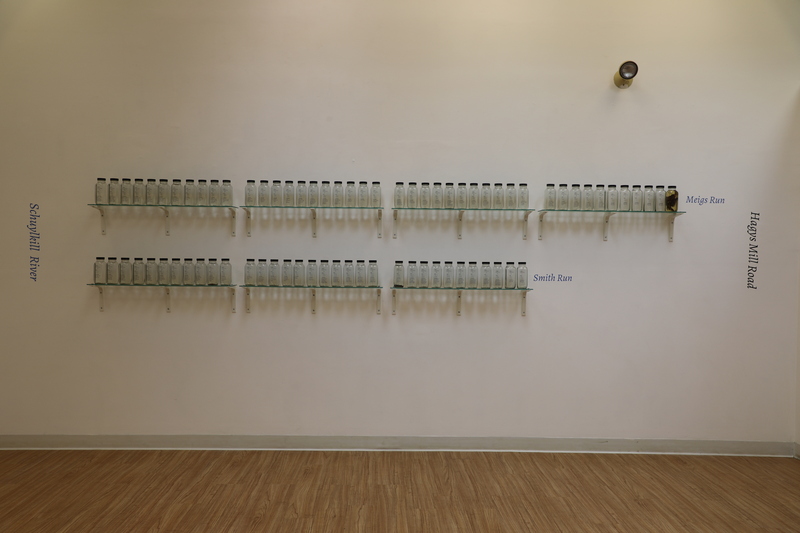 Braided Channel is open in the gallery now through February 2nd. Stop in to see the water samples and learn more about our discoveries! 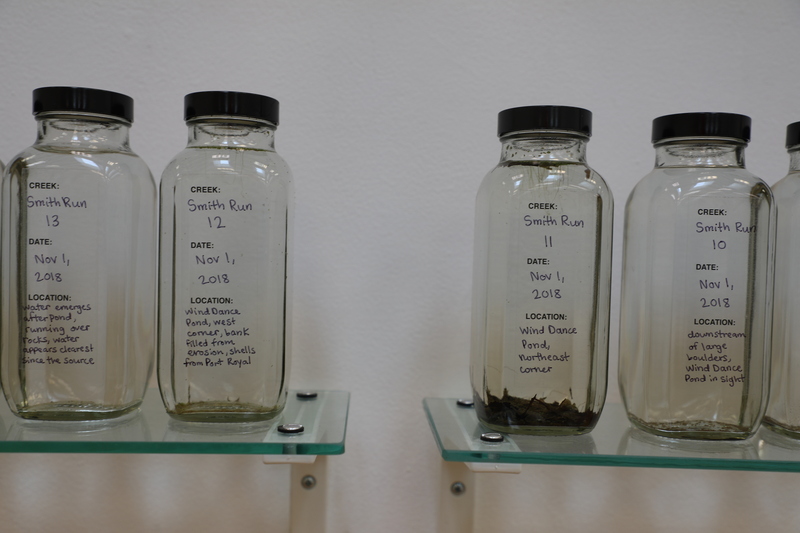 This entry was posted in Education, Environmental Art, Land Stewardship, Uncategorized. Bookmark the permalink.